SHANGHAI — Mercedes-Benz is carving out yet another niche in the burgeoning crossover market with a new small people mover — this one styled like a traditional SUV. 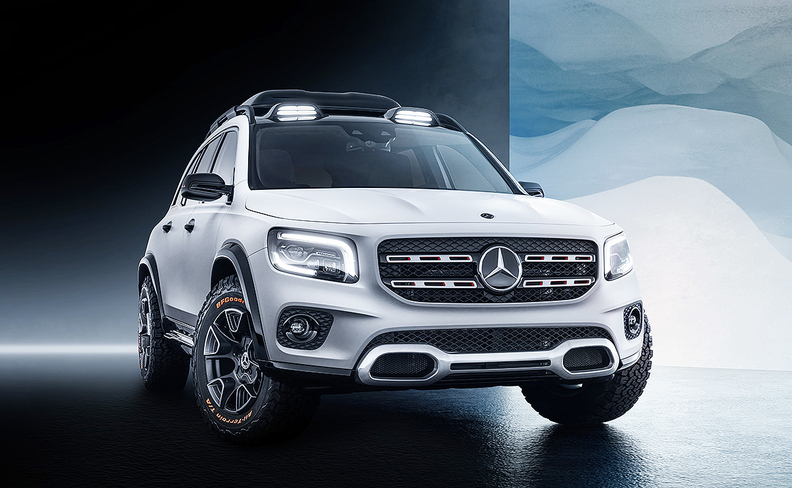 The automaker introduced the GLB concept — a new MFA2 platform companion to the GLA — on Monday on the eve of the Shanghai auto show. The GLB, referred to as the "Baby G-Wagen," has 2829-mm (111-inch) wheelbase and fits up to seven people. It will compete with SUVs such as the BMW X1 and Audi Q3. Pricing and launch dates for the GLB have not been disclosed. Mercedes said the GLB’s third row of seats offers "comfortable seating for two medium-sized occupants" despite the vehicle’s relatively moderate size. The company is also showing the sporty Mercedes-AMG A 35 sedan, the updated GLE SUV and the electric EQC model in Shanghai. China has been one of the few bright spots for the Mercedes-maker Daimler so far this year. Deliveries in its largest sales region defied an overall market slump to edge up 2.6 percent through March, while sales in U.S. and Europe fell. Global trade woes and slowing growth are undermining demand for new cars at a time of record spending on electric cars and new digital services. The GLB slots between the entry-level GLA and the GLC, and adds another crossover in the Mercedes showroom aimed at entry-level luxury customers. "We asked ourselves whether there is still space between the GLA and GLC," sales chief Britta Seeger said in a statement. "The concept GLB is the answer to this question." The concept harks back to the unveiling of the GLA unveiled in Shanghai six years ago, which heralded the brand’s successful shakeup of its compact-car offerings. The automaker sold more than 609,000 vehicles in this segment last year, about a quarter of global deliveries.